In a rare positive ad, Alabama senator Luther Strange packs more conservative iconography into a 30-second spot than one would think possible. As noted here earlier this week, the GOP special Senate primary in Alabama that concludes a week from today (though a September 26 runoff is virtually certain) has featured a lot of nastiness, particularly between interim appointee to the seat Luther Strange and U.S. Representative Mo Brooks. But I wouldn’t want readers to think there are no positive ads running in this race. Strange unveiled one recently that should probably get some sort of award for the maximum number of conservative ideological signifiers packed into a 30-second ad. It’s just amazing. In case you couldn’t see the ad or it moved too fast for you, it begins by reassuring Alabamans that Strange is a follower of Jesus Christ. 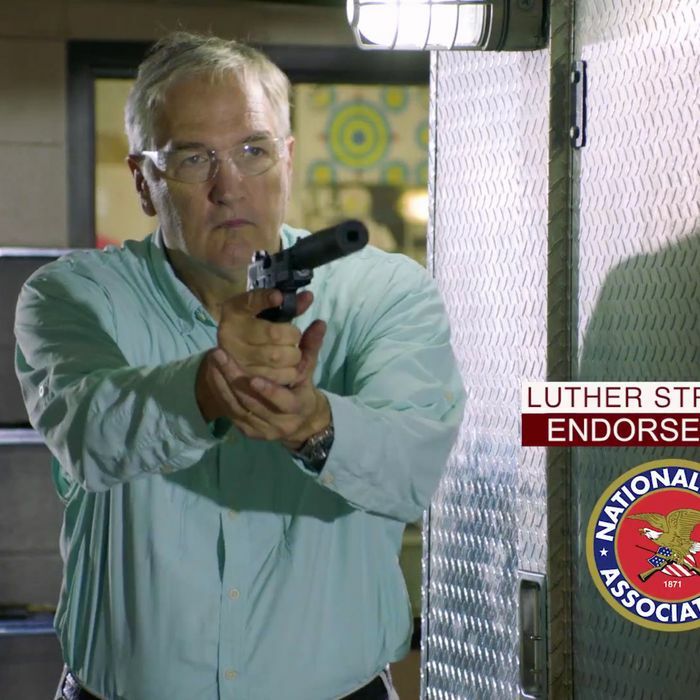 It ends with “Big Luther” shooting a handgun at a firing range (with the NRA emblem displayed) and promising to fight for “President Trump’s agenda every single day.” In between, the ad further testifies to Strange’s devotion to the two men whose approval ratings in Alabama occasionally rival Jesus Christ’s, Donald Trump and Jeff Sessions, while mentioning their common project, the wall. - There’s also an odd mash-up in the Trumperrific center of the ad wherein Strange’s boast about fighting corruption in Montgomery is amplified by the claim that he “convicted a corrupt House speaker,” an allusion to his office’s prosecution of Mike Hubbard, from which, as it happens, he had to recuse himself because of his business dealings with that same corrupt House speaker. - … which somehow leads without a pause to his victimization by “those Never Trump insiders,” which may be a veiled reference to wealthy Republicans associated with Mo Brooks, who all, of course, now share Strange’s hagiographical attitude toward the 45th president. All in all, Strange did everything to identify himself with prevailing Alabama GOP attitudes this side of invoking Alabama football coach Nick Saban, that other local rival to Trump, Sessions, and Jesus Christ. But then again, Auburn fans vote, too.